Business Faculty graduates were urged to play a meaningful role in their communities. 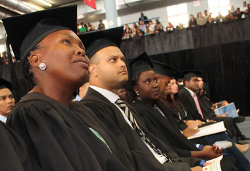 Guest Speaker Michael Lawrence, who is the Director of the National Clothing Retail Federation, addressed hundreds of graduates and their supporters, during the first in a week-long series of graduation ceremonies, which kicked off at the Cape Town campus on Monday. Lawrence says South Africa needs purposeful and passionate individuals, who will make positive contributions to the economy as well as to all other spheres of the country. “Your lecturers have skilled you and now is the time to act. Become doers,” he says. He informed graduates that making a difference in communities is what counts in life and not the material possessions they hope to acquire. One such graduate, who has already made major contributions to his community and hopes to do much more, is Timothy Goosen. 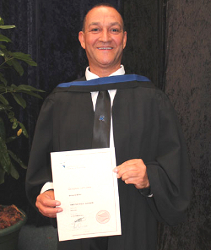 Goosen at the age of 62 received his National Diploma in Management and is the oldest student to graduate this year from CPUT. Goosen, who plans to study further next year, says he hopes his achievement will inspire others to educate themselves. “It’s never too late to study,” he says. The Business Faculty graduation continues in Bellville on Monday evening and in Cape Town on Tuesday morning.